The latest blockbuster Marvel superhero movie features a burgeoning romance between two unlikely characters. Moviegoers new to the world of the Avengers might have seen the Vision’s crush on Wanda Maximoff and thought “aw, cute!” Comics readers familiar with the history of the teammates probably reacted with “oh, no…” These two have had some bad times together. 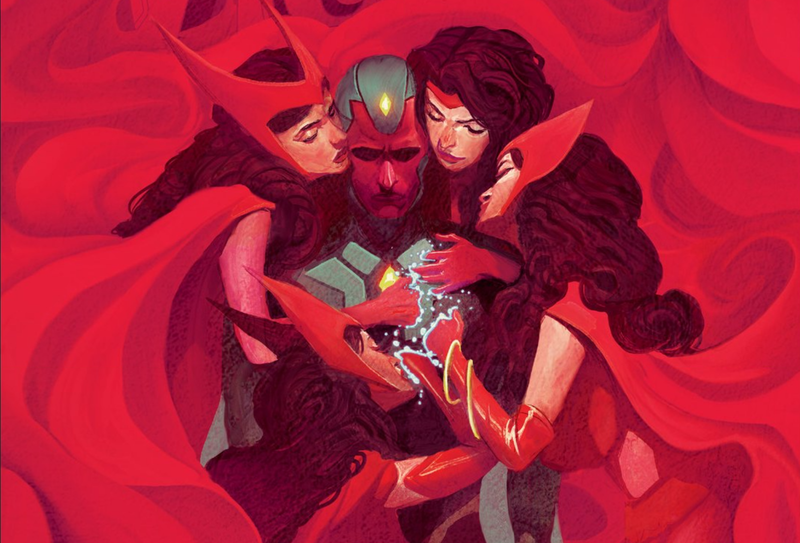 The newest issue of The Vision—written by Tom King with art by Michael Walsh, Jordie Bellaire and Clayton Cowles— looks back on the history of the series’ lead character and the human woman he used to be married to. In their earliest appearances, he was a synthezoid automaton created by one of the Avengers’ greatest enemies, she was a genetic offshoot spellcaster who used to be on the wrong side of the law. The Vision and the Scarlet Witch both joined the Avengers as outsiders with troubled pasts, which is what made their eventual courtship unexpected and sweet. Here was the robot who longed to feel growing into the most human of qualities; here was the mutant in the arms of someone who didn’t hate or fear her. They moved to the suburbs, where they endured the hatred of cul-de-sac bigots who didn’t want “their kind” as neighbors. Then, despite being a pairing of machine and organism, Vizh and Wanda later became parents to twin boys, after a pregnancy enabled by magic and the Witch’s probability-altering hex powers. But their unexpected parenthood ended in tragedy when a storyline revealed that the kids were apparitions fueled by Wanda’s subconscious. King’s journey back through the various inflection points of the characters’ star-crossed relationship showcases one of the best elements about superhero comics. Plot points and events can get refracted through different sensibilities as the years go by. The wince-inducing hamminess of the 1985 V&SW series reads differently when it gets recast as a veneer covering psychological trauma. But, that darker turn gets spun around again when subsequent writers make a point of redeeming Wanda. All of the preceding stories still count but readers’ understanding of the characters change throughout their publishing history. Has the Vision ever truly been content? Has the Scarlet Witch finally put the havoc wrought by her powers behind her? Only current creators can answer those questions and their truths for the characters under their stewardship will be as fleeting as the ones that preceded them. One of the mysteries of the latest Vision series has been the reason that the main character created an android family in his own image. By looking back at Vizh’s most lasting connection with a human being, issue #7 frames his desire to have a family as not that bizarre at all. Vision and Wanda may not be a couple anymore but his urge to know what it is to be human hasn’t abated at all. If anything, a simmering, unspoken loneliness may have made it worse. So, in his own fashion, he does the same thing the Scarlet Witch once did and creates up a wife and twin children for himself. They’re solid, circuits-and-cable companions who won’t fade away when no one’s looking. That makes the danger that comes from their very existence exponentially larger. The fallout from Wanda’s fake hex-generated kids wound up hurting herself the most while the dysfunction of Vision’s family has taken the lives of innocent people (as well as one villain). A scene in The Vision #6 foreshadows an eventual reckoning where, spurred on by the concern of a Scarlet Witch who’s far healthier emotionally, the Avengers will be coming to grips with the synthezoid weirdness happening in the Washington, D.C suburbs. The Scarlet Witch still loves the Vision but it might not be enough to save him from trying to be human.